Ford Motors Company has unveiled the next generation Endeavour which will go on sale in 2015. 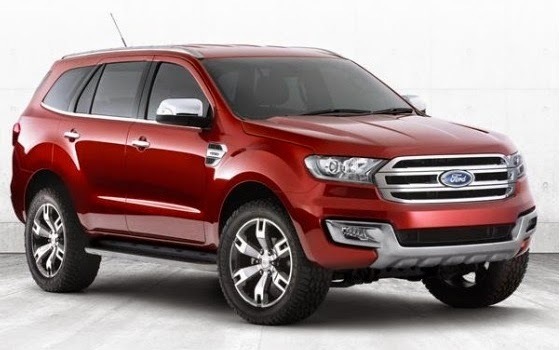 Ford Endeavour which is known as Ford Everest in international marketsd has good presence in countries like China, Australia, South Africa and New Zealand. Next Generation Ford Endeavour concept was shown in 2013 and the model unveiled retains all most everything seen on a concept prototype. The new Endeavour gets daytime LED running lights, aluminium front and rear cuff plates and large hexagonal grille. In the inside there is an eight inch touchscreen and Ford’s new SYNC2 infotainment system. Known for its all terrain capabilities, the new Endeavour will get safety systems like hill start assist to control ascent, descent and curve when on a hill, a warning system for lane departure, a system to indicate blind spots, adaptive cruise control and ESP.